Artist's illustration showing a star behind a shattered comet. 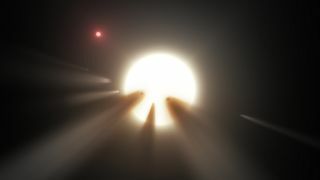 A faraway star's mysterous dimming was most likely caused by comets, a new study suggests — though it doesn't rule out the much-ballyhooed possibility of an "alien megastructure" in the system. Observations by NASA's planet-hunting Kepler space telescope revealed that the star KIC 8462852, which lies about 1,500 light-years from Earth, dipped in brightness dramatically in 2011 and 2013, dimming by up to 22 percent. A team of astronomers led by Massimo Marengo of Iowa State University decided to follow up on Kepler's work. They studied observations of KIC 8462852 made in January 2015 by NASA's Spitzer Space Telescope, which is optimized to view in infrared (heat) wavelengths of light. Dust emits infrared light when it warms up, so an infrared signal coming from KIC 8462852 would suggest that a big cloud of the stuff — generated by an asteroid collision, perhaps, or a giant impact on a planet —exists in the system. But Spitzer saw no such signal. "The lack of strong infrared excess 2 years after the events responsible for the unusual light curve observed by Kepler further disfavors the scenarios involving a catastrophic collision in a KIC 8462852 asteroid belt, a giant impact disrupting a planet in the system or a population of dust-enshrouded planetesimals," Marengo and his colleagues wrote in the new study, which was published this month in The Astrophysical Journal Letters. The researchers instead suggest that a family of comets on a long, elliptical orbit might be responsible for the strange dimming of KIC 8462852. These comets or comet fragments may have blocked the star's light in 2011 and 2013 (when the lagging members finally passed in front of the star from Kepler's perspective), then moved off into deep space by the time Spitzer trained its heat-seeking eyes on the system in January 2015. That being said, the alien-megastructure hypothesis remains in play, scientists said. "We didn’t look for that," Marengo said in a statement. "We can’t really say it is, or is not. But what the star is doing is very strange. It’s interesting when you have phenomena like that — typically it means there’s some new physical explanation or a new concept to be discovered."